June 13, 2018 By Tina M 4 Comments This post may contain affiliate links. Read my disclosure policy here. I was pleased to see that those who had the same pregnancy pillow as I did were just as pleased. It makes a WORLD of difference for sleeping and comfort. This is the first pregnancy (of 4) that I am still sleeping through the night in the 3rd trimester. 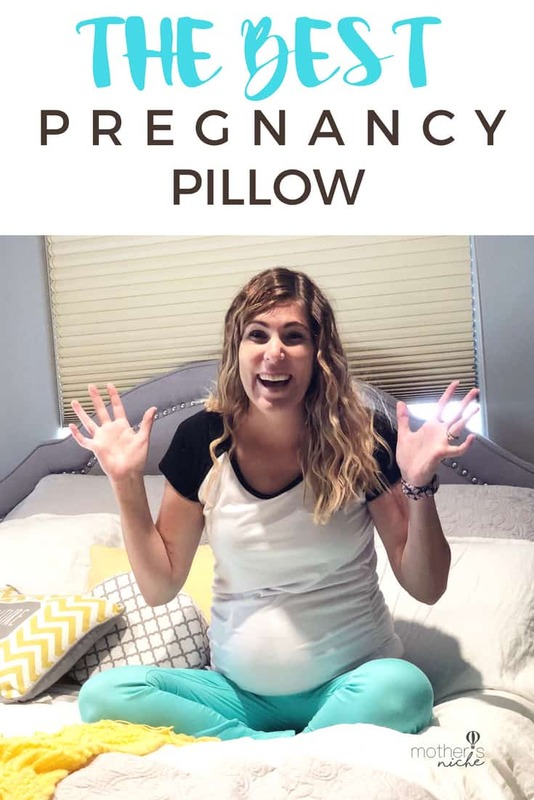 When it comes to the best pregnancy pillow, I’m actually going to tell you about two, because it really depends on what trimester you are in and what you can afford. I found it easier to explain what makes these two pillows the best pregnancy pillow, by recording a little video. Watch the video below for a good explanation of the two pillows. I always start using a pregnancy wedge pillow from the very beginning of my pregnancy because it helps keep the weight of the growing baby off the back. It’s also super affordable and travel-friendly. The pregnancy wedge pillow is a no-brainer for me to recommend, just make sure you get this brand and not this one (I’ve tried both and the latter is too flimsy). I’ve loaned this pregnancy pillow out a couple of times and I always end up having to buy a new one because the moms I loan it out to want to keep using it after giving birth. It’s the perfect pillow for nesting in that awkward spot between your belly and the bed. If you’re wanting to know the best pregnancy pillow overall it’s not the typical c-shaped pillow you often see advertised for pregnant women. The pillow I absolutely love is this u-shaped pillow. Not only is it the best pregnancy pillow for back pain (which you will experience a lot of during pregnancy), but it’s also the best pregnancy pillow for stomach-sleepers (it helps you sleep on your stomach a lot longer than you would be able to without it). Another thing that makes the U-shaped pillow the best maternity pillow is the fact that you can still use your favorite pillow with it. If you have to sleep with a particular pillow for neck support, you can turn the pillow around and use the “U” part for in between your legs, rather than for your head. Do you have a pregnancy pillow that you love? If so, which kind of pregnancy pillow do you have? Thank you for the review. Indeed, every pregnant mom deserve the best! Love this thank you! What is the specific U-shaped pillow you meant to link to? The link isn’t working, it just goes to a general amazon search for U-shaped pillows.